How to Clean Dishes by Hand – No Dishwasher? No Problem! Yes, dishwashers are a pretty nice luxury to have, but they make you just a wee bit lazy, don’t you think so?! Moreover, not everything can fit into a dishwasher so you have no choice but to wash bigger dishes by hand. There’s also the occasional technical issue wherein the dishwasher breaks down or just isn’t running well. Therefore, knowing how to clean dishes without any assistance from a machine (or others) is a must! As simple as it may be to do dishes, it pays to knows how to do it the right, most time and energy efficient way! Check out this step by step guide on how to do just that! Take out all the dirty dishes and place them beside the sink. Now wash and scrub the sink nice and clean using an old sponge and a little liquid soap. Once your sink is clean, plug it with its original stopper (you can purchase a standard sink plug from a hardware store if you don’t have one). Pour in about two tablespoons of liquid soap and fill the sink with enough water to submerge your dirty dishes. Use warm or mildly hot water for more soiled utensils. Step 2: Soaking Does Half the Work for You! Although you can clean your dishes under running water like a lot of people do, soaking them prior to scrubbing is the difference between using minimal effort and wearing your arm out! It doesn’t take long for food bits and gravy to dry and harden on your dishes for which you’ll need a good amount of energy and time to scrub them clean. Hence, we suggest you soak the dishes in the sink for at least 10-15 minutes before you begin scrubbing. You have two options when scrubbing your dirty dishes; you can either hold them under the sudsy water and scrub them clean, or drain the sink and scrub them using running water as and when needed. Cleaning utensils while submerging them in a soapy solution make it easier and faster to get them clean; however, if the water becomes too dirty after soaking (or while cleaning) you’ll have the headache of draining the water out and filling the sink back up. While this somewhat defeats the purpose of cleaning your dishes quickly, the choice is yours! Whichever method you choose, be sure to keep the scrubbed dishes aside so you don’t risk cleaning the same dish twice or thrice! Step 4: Rinse, Dry and No Repeat! 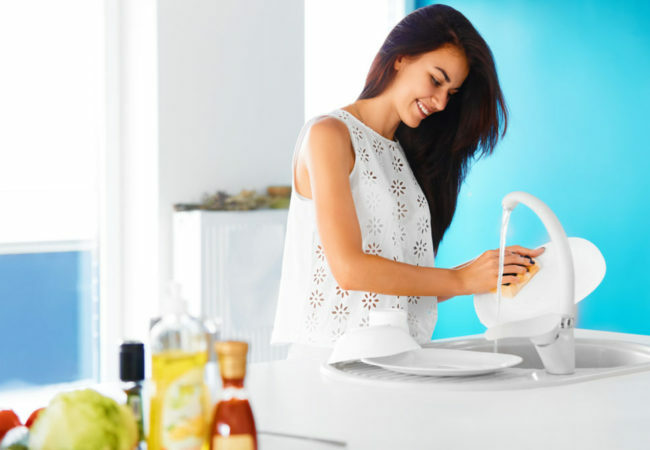 Unlike a dishwasher that doesn’t always give you spotlessly clean utensils, when you clean your dishes by hand, you don’t have to worry about re-washing them. Simply rinse off the soapiness with running water and you’re done! Remember to use both hands when rinsing; one to hold the dish and the other to help wash off the soap by using a wiping motion under running water. Wipe them dry with your kitchen cloth/towel or leave them to air dry on the dish rack. An average scrubber or sponge isn’t always enough; especially when cleaning very soiled dishes. You need to have at least 4 different types by your sink’s side; a soft sponge, a regular (slightly abrasive scrubber), stainless steel scrubber; and a dish brush. Use the dish brush for oily or greasy utensils as sponges/scrubbers require frequent rinsing (while cleaning) to remove the grease off them. While regular dish soap (liquid or bar soap) is perfect for daily washing; it helps to keep a more advanced dish cleaner at hand for very greasy dishes. Avoid soaking knives for more than 5 minutes; excess exposure to water can cause bluntness. Also, do not soak wooden cutting boards as they get warped if left wet for too long. After cleaning, use a cloth to soak up the excess water and leave to air dry. Teflon coated utensils require special cleaning. Never use metal or abrasive scrubbers when cleaning. Soak them in warm water and use a soft sponge to scrub. Instead of soaking your blender, pour a teaspoon of liquid soap in and fill it halfway with water. Put the lid on and run it for about 20 seconds. Finish off the cleaning by rinsing it under running water. If you have a burnt stainless steel dish, add two tablespoons of baking soda to the bottom, mixed with just enough water to make a paste that covers the entire base. Leave it for 15 minutes and then use a stainless steel scrubber to clean it. The only thing simple at Simply Maid is our cleaning tips and guides! We break it down nice and easy for homeowners to clean up timely and efficiently. On the other hand, Simply Maid provides professional cleaning services for daily or intense household cleaning. Have a look at our great prices and service to hire a cleaning with us for all your home-related cleaning needs. If you have any questions, feel free to contact us! Beat the Clock with These Cleaning Shortcut Tips! Microwave Cleaning Guide – 2 Methods, 1 Fantastic Result! Next Post: BBQ Cleaning Guide – Keep Your Grill Clean and Your Barbeque Mean!